…as dispensed by PFF’ers Mike McGuire, Larry Mitchell, Homer Eaton, Carel and Dave Peterson and yours truly. With the streamflow dropping below 1,000 CFS, the fly-only section below Lewiston Dam on the Trinity River offered prime flyfishing the weekend of July 14-16 and our distinguished group did everything possible to educate this year’s class of juvenile steelhead on the perils of indiscriminate feeding. Dare we dream of times when the catching equals the fishing? Such was our weekend when the question of “what pattern or technique didn’t work” was the norm instead of the exception. 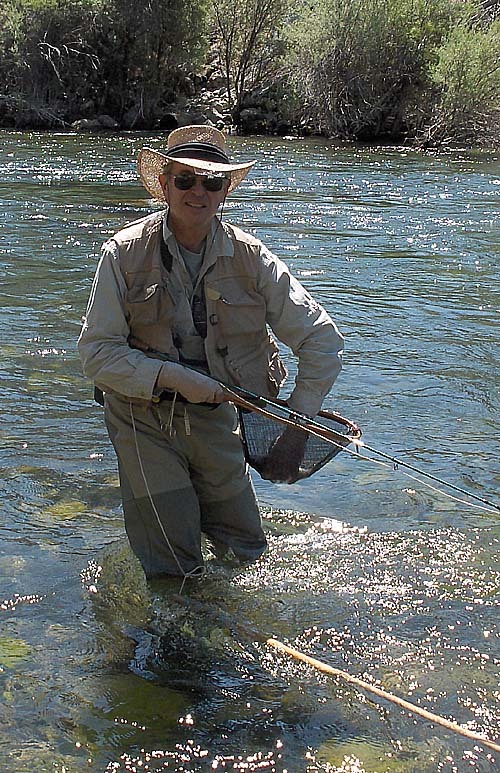 We caught fish on dries and emergers, whether fished on the surface, in the film or wet. We caught fish on nymphs of all species, sizes and genders. We caught fish using techniques executed well, others performed so-so, and some with no style whatsoever, something for which those of us who’ve been out of touch for awhile can give thanks. It didn’t much matter. We caught fish on one-fly rigs, two-fly rigs and had them strike our indicators. We caught fish on the drift, on the swing, under drag, by touch, by sight and by accident. We caught fish by stalking, walking and, for those of us too caught up in the action, by standing in the same place hour after hour simply because there wasn’t a need to go anywhere else. Hell, McGuire even scored doubles on simultaneous casts (witnessed, no less, and not because I crossed his line with mine). Despite our best efforts, however, I doubt we educated but a fraction of the population, something certain associates of ours should thank us for come future fall Club steelhead extravaganzas to the watershed. So go forth with confidence, Mikey. We left a few innocent ones behind, just for you.